Kimberly Ann Kaloyanides Kennedy won her coveted position as a violinist with the Detroit Symphony Orchestra at the age of 22. In 2003, Kennedy further realized her dream when she became Associate Concertmaster. Kennedy began her study of the violin at the age of 5 in Dayton, OH. Being the daughter of a Minister of Music and church organist allowed her many chances to share from her heart in front of congregations. Her love of music became what undoubtedly would be her career as she pursued her studies at Brevard Music Center and Interlochen Arts Camp as the Governor’s Scholar for the state of Ohio. She continued her studies at the Sarasota Music Festival; spent four summers at the Aspen Music Festival on Fellowship, as Associate Concertmaster of the Chamber Orchestra; spent three years at the Harid Conservatory in Boca Raton, Florida with Sergiu Schwartz; and finally landed at the University of Michigan with Paul Kantor. 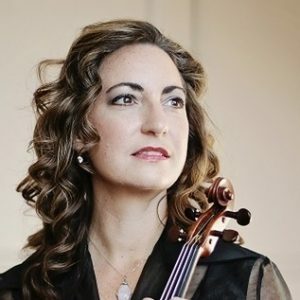 It was half way through her senior year at Michigan in 1998 that her hard work paid off, when she joined the first violin section of the Detroit Symphony Orchestra. Throughout her training, she won several prizes in competitions around the country, including the Grand Prize in the National MTNA competition and 1st prize in the Greek Women’s National Competition in Chicago; the Skokie Valley Concerto Competition, where she performed Barber Violin Concerto; the University of Michigan Concerto Competition, where she performed Ravel’s Tzigane; and the Harid Conservatory Concerto Competition, where she performed the Mendelssohn Violin Concerto. Kennedy was one of the few Americans invited to the International Violin Competition of Indianapolis in 1998. She solos regularly with the Detroit Symphony Orchestra. Kennedy enjoys performing chamber music regularly around Michigan with various groups, including the Detroit Chamber Winds & Strings, on series such as Chamber Music North, Fairlane Concert Guild, Pro Mozart, Classical Brunch in Birmingham and the Great Lakes Chamber Music Festival. She is passionate about serving others through her music, both at church and around the community, and loves teaching and sharing what God has put in her heart with her students.